Brief scores: India 281/7 (Hardik Pandya 83, MS Dhoni 79; Nathan Coulter-Nile 3/44, Marcus Stoinis 2/54) beat Australia 137/9 (Glenn Maxwell 82, David Warner 51*; Yuzvendra Chahal 3/30) by 26 runs (DLS). After winning the toss, India decided to bat first – a decision Virat Kohli called a ‘no-brainer’ – expecting the pitch to slow down as the day progressed. India decided to field two proper spinners in the form of Kuldeep Yadav and Yuzvendra Chahal and a part-time option in Kedar Jadhav. From the very start of the match, Pat Cummins gave early indications that it was not going to be an easy affair for the hosts as the bounce and carry off the deck zoomed past Rohit Sharma’s blade and India could only muster 10 runs off the first three overs. Nathan Coulter-Nile kept bowling at a nagging line and when Ajinkya Rahane missed a free-hit ball, the Perth pacer changed the length of the ball to get him caught behind off the very next ball to give Australia their first wicket. Two overs later, Virat Kohli also played a similar shot, only to slice to the backward point where Glenn Maxwell took a stunning one-handed catch over his head. Manish Pandey followed suit immediately, jamming a full ball to Matthew Wade when the hosts were on 11 in 5.3 overs. However, Rohit and Jadhav tried to rebuild the innings - Rohit through calculated aggression and Jadhav through his typical freakish approach - and added 50 runs for the fourth wicket before the former was dismissed by Marcus Stoinis hooking a delivery straight to deep square leg. Soon after Rohit’s dismissal, Stoinis’ short ball sent Jadhav back to the hut as India were reduced to 87 for 5 in 22 overs. 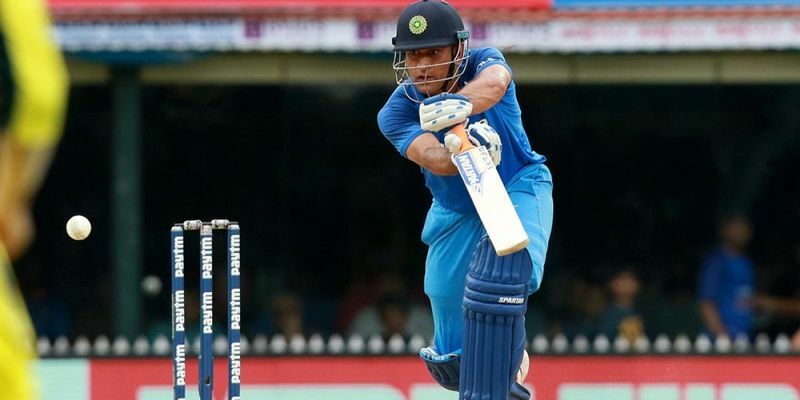 With more than 28 overs remaining, MS Dhoni came down to the middle and started taking singles to keep the scorecard ticking as India reached 104/5 in 25 overs. With India languishing at an unusual position, the onus was the duo of MS Dhoni and Hardik Pandya to curb their natural attacking instincts to play a more defensive brand of cricket. Pandya did that remarkably well, getting into his thirties with a strike rate less than 80. However, after that, the Baroda all-rounder launched a stunning assault on the Aussies that gave the Indian innings impetus and the raucous Chennai crowd some voice. The remarkable phase began in the 37th over when Pandya thrashed Adam Zampa for a four and three consecutive sixes – each of them down the ground to complete his third ODI half-century. On the other end, Dhoni also judged the situation brilliantly by playing out spells from Coulter-Nile and Cummins. With the duo in their zone, India finished the third Power Play at 198 for 5. However, Smith recalled Zampa once again for the 41st over, but Pandya sent the leg-spinner for another huge six down the ground. However, Pandya fell on the very next ball when he got a top-edge to short third-man after scoring a 66-ball 83. After the all-rounder’s dismissal, Bhuvneshwar Kumar and Dhoni kept India going as the former found the odd boundary while Dhoni kept the board ticking with quick running. A single in the 47th over helped Dhoni get his 100th international fifty, before he unleashed his ruthless self against James Faulkner, picking him for two fours and a six before getting out for 79. Eventually, India finished with 281, a total that looked competitive enough to restrain the visitors winning the series opener easily. The game disrupted for two hours due to incessant rains in Chennai and when the rain gods finally relented, the match was reduced to a 21-over affair with Australia needing 164 runs to win the game. However, Jasprit Bumrah and Hardik Pandya kept bowling in the tidy channel to perplex the Aussie openers and debutant Hilton Cartwright succumbed to the pressure as became Bumrah’s first victim. Steve Smith also failed to last long as Bumrah took a fine catch off a Pandya delivery to leave Australia reeling at 25/2 at the end of 6 overs. Kohli introduced spin in the form of Kuldeep Yadav and the chinaman put the pressure on the visitors, with a tidy over that led to Pandya getting rid of Travis Head before Yadav got Warner caught by Dhoni in the next. With Australia under the cosh with the score at 35/4 after eight, the incoming Glenn Maxwell smoked Pandya for 10 before thrashing Yadav for 22 with three consecutive sixes. But just as it looked like Australia were clawing their way back into the game, they lost two wickets, Maxwell and Stoinis, in four balls that saw the scoreboard reflect 78/6 with six overs to go. The things went from bad to worse for the visitors when Matthew Wade was stumped by MS Dhoni in the 16th over that made an Indian victory nothing but a formality. Although Faulkner played a rather attacking cameo towards the end, it was too little too late for the visitors to win the game as India restricted them with 137/9 to win the first game of the series.